As a career veteran of the art and design industries formerly with Larson-Juhl, a global Berkshire Hathaway Company, Ginger Hartford is recognized as a highly accomplished strategic marketing and business development leader in the BUSINESS OF DESIGN. As a patented inventor of design technology, she also has keen insight into emerging visualization tools and social media trends. 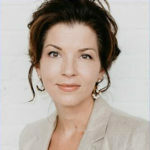 Ginger’s extensive experience includes business development, product design, integrated marketing and branding with leading national retailers, international online art marketplaces, the designer community and major channel brands across home furnishings, art & framing, and photography.